On 25 August 2000, eleven men of the 1 Royal Irish (1RI) Regiment (UK) and their Sierra Leone Army (SLA) liaison officer began a seventeen-day hostage ordeal at the hands of a motley gang of Sierra Leonean renegades known as the West Side Boys (WSB). As negotiations devolved, a Hostage-Rescue (HR) mission, called Operation Barras, was directed by the British Director of Special Forces (DSF). Although the mission would prove to be largely successful; proving British Special Forces (SF) capability and crippling the renegades in Sierra Leone, it was far from perfect. The SAS operators and paratroopers participating gave it the nickname Operation Certain Death due to prescribed mission parameters which would give the operation a slim chance of success and a strong opportunity for disaster. This article will examine Operation Barras using Admiral William McRaven’s theory of Relative Superiority, the idea that smaller force gain an advantage over a larger or well defended enemy, and six principles of special operations (Simplicity, Speed, Surprise, Security, Repetition, and Purpose) in order to arrive at what allowed this special operation to succeed and what steps could have been taken to improve its outcome. This paper will look at the circumstances of the hostage incident, the actors involved on each side, the plan and sequence of events concerning the mission, and finally the application of the theory of RS in analysis of the mission. The circumstances surrounding the unfortunate capture of Major Alan Marshall and the rangers of 1RI were a compound of deteriorating violence and political tribalism in the failed state of Sierra Leone stretching back decades to the collapse of its legitimate government in 1967. For our purposes, however, events began with the SLA coup that removed President Kabbah from power in 1997. The United Nations did not recognize the new dictator and proceeded to place sanctions on the country. With the help of the Economic Community of West African States Monitoring Group (ECOMOG) President Kabbah was placed back in power in 1998 which prompted the Revolutionary United Front (RUF), Kabbah’s main resistance, to enact reprisals on the people of Sierra Leone, especially around the capital of Freetown. The violence was temporarily brought to a halt with a peace treaty on 7 July 1999 which called for the disarmament of rebel groups. The UN mission to assist the disarmament began in October under the title, United Nations Mission in Sierra Leone (UNAMSIL). The RUF resisted the largely ineffective efforts of UN forces as UN troops mainly consisted of unprofessional, corrupt African soldiers from the region and foreigners that had no stake in the conflict. Government loyalists were called to defend Freetown, home to numerous foreign nationals, and so fighting resumed. It was into this tense atmosphere that UK involvement in Sierra Leone began. Operation Palliser, comprising an advance force of Royal Marines and Paratroopers, was put in effect on 1 May 1999 in order to extract UK nationals and other allied citizens. As the RUF deteriorated under SLA and UK pressure, the renegade group calling themselves the West Side Boys rose to prominence. 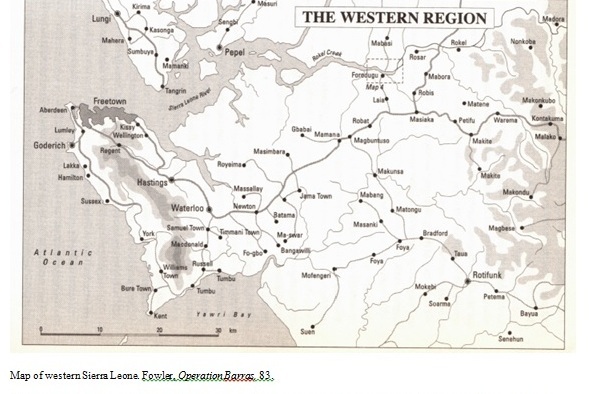 A collection of RUF fighters, SLA defectors, and violent criminals, the WSB began a campaign of highway robbery and extortion along the road from Freetown to the major towns to the north and east, such as Lungi (encompassing the main airport in Sierra Leone) and Masiaka. Utilizing child soldiers, a plethora of intoxicants, and atrocious violence, the WSB were a major threat that UNAMSIL had difficulty deterring or disarming. This dangerous and unpredictable environment is where the 1RI operated in August 2000. Based out of Benguema Training Camp (BTC), Major Marshall was on liaison 25 August to see the UNAMSIL Jordanian Battalion 2 (JordBat2) at Masiaka which was overseeing the rebel disarmament in the WSB region of Occra Hills, to the Northwest of Masiaka, along Rokel Creek. Major Marshall and his eleven-man patrol learned from the Jordanians that the WSB were preparing to disarm and so took the initiative to enter WSB territory to gather intelligence on the gang. Leading his three Land Rovers deep into the forest around the WSB village of Magbeni, Major Marshall was forced to stop by WSB men standing in the road; he had entered their territory without permission. Upon exiting their vehicles the British were surrounded by twenty-five WSB and disarmed of weapons and valuables on order from the WSB leader “Brigadier” Kallay; luckily the patrol got a signal reporting their detainment back to Benguema. The men were subsequently taken across the river to Kallay’s headquarters at Gberi Bana, a decrepit palm oil plantation where they were imprisoned and their SLA liaison was abused; he was viewed as a traitor by the ex-SLA and RUF men of the WSB. 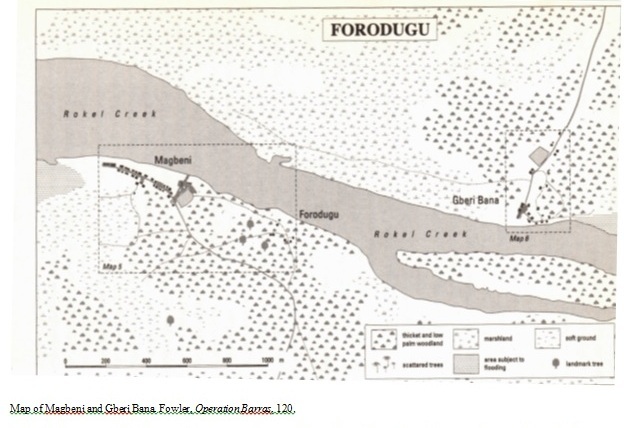 Gberi Bana, a collection of huts around a main trail running from the creek north, would not be an easy location to mount a rescue; the creek flowed on its southern side but to the north and east there was dense vegetation and marshes to the west. Within Gberi Bana were stationed over 100 men and women of the WSB Gulf “Battalion” and their child soldiers, formed into Small Boys Units (SBU). Thanks to two four-man SAS patrols that infiltrated the area on foot when the hostage incident began, the British knew the WSB had access to or were armed with: 2 heavy machineguns (HMG), a 60mm and 81mm mortar, rocket-propelled grenades (RPGs), AK-47 assault rifles, medium machineguns, grenades, and mines. Just over a kilometer down the river at Magbeni, situated along a road running east-west, were another over 100 WSB and SBU with access to the 1RI captured Land Rovers, including their 12.7mm machinegun, a trunk mounted HMG, 3 “technicals” (named after the Somalian’s pickup trucks which had machineguns bolted to the beds), as well as mortars and a similar assortment of small arms. This unit at Magbeni was close enough to threaten the rescue operation at Gberi Bana, either by crossing in boats or by supporting fire from their mortars and machineguns. Also needing to be taken under consideration by Op Barras planners was another “Battalion” of WSB, of similar composition, at Liai Junction, about five kilometers to the south. The WSB and their SBU were an unpredictable and dangerous element to be considered; they adored violence, believed themselves invincible due to local rituals, and were fueled by marijuana and cocaine (a depressant and a stimulant), a mix that would prove to make them fearless and dangerous when pressured. The locale and unpredictable forces in the area would make a rescue mission high risk and dictate the planning of Operation Barras. Planning for the rescue began one day after the hostages were taken, on 26 August. The Commanding Officer of 1RI met Kallay at Masiaka for negotiations; Major Marshall accompanied Kallay and managed to sneak the negotiators a map of Gberi Bana and the prisoners quarters. Kallay requested a satellite phone and medical supplies which he received on the 30th in exchange for releasing five of the 1RI men. The freed men would provide intelligence on the WSB and the phone would actually serve to pinpoint Kallay’s location; it was controlled by British military intelligence. Negotiations would be drawn out as the WSB requested full amnesty and the release of imprisoned RUF leader Foday Sankoh; an impossible concession for the British or Sierra Leone, but these discussions allowed negotiators (undercover SAS) to gather intelligence. The British realized there was no way that the men were going to be freed and so the DSF selected the rescue force on 31 August. A Company, 1 Paratrooper Battalion (1PB) under Major Mathew Lowe with 120 men was readied to provide support and diversion at Magbeni; they were chosen for their experience fighting in the jungles of Jamaica on a recent exercise. D Squadron (DSqn), 22 SAS Regiment with twenty-five men would provide the main effort in rescuing the hostages. A Company was given the cover story of a readiness exercise in Southern England to explain their move from home base Dover. Major Lowe was given until 3 September to organize for the mission at which point the company was moved to Dakar, Senegal and furnished with photos of the area and intelligence from the SAS patrols on the ground. An accidental leak of signals and 1PB unit composition by HQ Land Command, however, meant that the public and WSB knew a rescue would be mounted, although this incident did disguise the SAS involvement. Lowe’s objective was to defeat the WSB in Magbeni in order to prevent them from interfering with the rescue operation at Gberi Bana. To this end, A Company was provided with extra mortar and HMG/MMG sections to give them fire superiority over the numerically superior WSB. Ground infiltration and support was extremely difficult in the dense terrain and so A Company would insert at Landing Site 2 (LS2) by helicopter to the southwest of Magbeni and conduct a west-east sweep through the village. They only had one CH47 Chinook to transport them, however, so they would first have to secure LS2 for the remaining element to arrive. After the sweep was complete and any WSB equipment destroyed they would board a departing Chinook just east of the village. Three Lynx attack helicopters would provide cover to the men and destroy any WSB attempting to cross the river to Gberi Bana. With their plans set the men of A Company began live fire exercises and rehearsals in order to work out the problems of operating in sweltering Sierra Leone on a mockup of the village at Hastings, 48 kilometers south of Freetown. Practice would include fighting in dense vegetation; which would prove critical on mission. Meanwhile, DSqn was preparing for the primary task of rescuing the six remaining 1RI men and their SLA ally along with the secondary objective of rescuing twenty-two local Sierra Leoneans. As they were the main effort, the twelve fire teams (two men in each) of DSqn would use two Chinooks to fast rope directly into Gberi Bana and secure the prisoners immediately; it would happen pre-dawn to increase the chances of the prisoners being concentrated and the WSB asleep. The two SAS patrols around Gberi Bana would provide protection while the men were fast roping in and extra firepower. The helicopter, with miniguns for defense, would land 150 meters north of Gberi Bana and await their extraction. 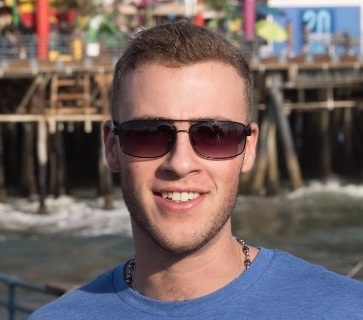 The men of DSqn would have to rely on shock and awe tactics; they could expect a one minute window before the WSB got to their senses and counter attacked. They could also not afford to waste time on target as there would be SBU and WSB patrols operating in the area. Realizing negotiations were failing on 9 September, DSqn and A Company were ordered to conduct Op Barras on the morning of the 10th. At 0500 hours boarding began at Hastings and after a fifteen minute flight the teams were on target by 0640. As the Chinooks of DSqn came in low to drop the men, the two four-man SAS patrols burst from the jungle to engage WSB members heading for the prisoners hut and those on guard duty who were ready to counter attack. The Chinooks managed to avoid RPG rounds and get DSqn on the ground and then proceeded to the extraction point. DSqn moved quickly; one team killed the guards and secured all twenty-seven hostages while another proceeded to find their SLA officer who was being held separately. The rest of DSqn fanned out eliminating all WSB who offered resistance; these were numerous due to perceived invincibility and drugs. DSqn also succeeded in capturing a frightened Kallay. Within twenty minutes DSqn primary and secondary objectives were accomplished, they boarded their Chinooks and after picking up casualties from Magbeni were on their way back to Hastings by 0700. DSqn lost only one man while securing twenty-eight hostages; Trooper Brad Tinnion was hit by a stray AK round and would later die during evacuation. The story across the river at Magbeni was different, however. As the advance units of A Company hit the ground at LS2 at 0640 they were surprised the ground was not solid as intel had made it seem and found a chest-high bog. What was supposed to be a quick sprint to cover turned into a hundred meter slog under fire from the village. A Company made it unscathed, however, to setup for the assault on Magbeni and secure LS2 for the second wave. After the second group, including the HQ and heavy weapons elements, arrived, a Lynx destroyed the truck-mounted HMG keeping the advance party pinned down. A Company then began their west-east sweep through the village, driving the overwhelmed WSB before them. At the eastern most huts in Magbeni a small cadre of WSB held their ground ferociously, even hitting A Company HQ element with mortar fire which injured seven men including Major Lowe. This was a critical moment as command passed to second-in-command Captain Danny Matthews. Clear communications with DSqn across the river allowed the injured to be evacuated almost immediately as DSqn Chinook made a daring landing in the middle of Magbeni between A Company and the WSB. With their injured safely evacuated, A Company’s preparation paid off; under superior firepower they routed the remaining WSB east into the forest and setup on either side of the main road for a counter attack. Magbeni was secure by 0800. A Company then proceeded to destroy WSB ammunition caches, the three technicals, other useful equipment they came across, and even managed to recover the three captured Land Rovers. By 1100 A Company was on its way back to Hastings. WSB resistance had been fiercer than expected, costing the British one dead and twelve wounded. The WSB, on the other hand, had lost at least twenty-four fighters with more fatally wounded at large. DSqn’s rescue had gone so well because the local hostages had been instructed by Major Marshall on how to behave when rescue came; lie on the ground and be compliant. They also had eight SAS already on the ground who provided valuable support, not to mention the elements of speed and surprise that will be examined further. Operation Barras would serve strategically to strengthen Sierra Leonean authority as the WSB would begin turning themselves in and solidified SAS reputation as one of the finest Special Forces units. Operation Barras was not without faults, however. DSqn completed the main objective of the operation, rescuing the hostages, in near isolation form A Company. A Company was meant to provide a diversion and prevent WSB support to Gberi Bana, but was it really necessary? twelve men were wounded in what essentially only accomplished the destruction the WSB and their equipment, a retaliatory gesture more than it was essential to rescuing the hostages. Had the SAS gone in undercover of darkness, inserted along the river by Special Boat Service (SBS) craft, A Company would not have been needed. The SAS were capable of performing such a clandestine operation and exfiltration by the river quickly enough to avoid WSB support arriving, as was seen at Gberi Bana; twenty minutes, which would have been less if the men did not have to fast rope or use helicopters. SBS infiltration is just one way in which Operation Barras could have been improved upon. However, Op Barras as it did occur will be examined using Admiral McRaven’s theory of Relative Superiority and six principles of special operations. In the words of Admiral McRaven, Relative Superiority in special operations is “a condition that exists when an attacking force, generally smaller, gains a decisive advantage over a larger or well defended enemy.” It is achieved at the pivotal moment in an engagement. McRaven’s model expects SF to be more vulnerable the longer a mission last, due to their inherently minimal resources and manpower, as they encounter the firctions of war (enemy will and uncertainty). In Op Barras the British achieved relative superiority the moment they were on the ground at Gberi Bana and Magbeni, at 0640. They were highly vulnerable while in their Chinooks over the target zone, as a single RPG round could have ended the mission, but once they hit the ground their superior firepower and training gave them the advantage over the numerically superior WSB on the defensive. Their vulnerability decreased and degree of relative superiority increased over time as growing numbers of WSB fled or were killed and the Lynx attack helicopters added to their fire superiority. Now Admiral McRaven’s six principles of special operations will be examined as they relate to Op Barras. D Squadron’s plan to secure the hostages was a perfect example of simplicity in planning. They would infiltrate from a Chinook directly into their objective, eliminate any resistance, secure the hostages, and meet that same Chinook near the objective to escape. There were no complicated steps or objectives to detract from the primary goal of rescuing the hostages, although losing a helicopter remained a very real risk. With assistance from the four-man patrols, D Sqn completed their objective, according to plan, quickly and easily. The planners of Op Barras deviated from the principle of simplicity, however, in their plan for a diversion at Magbeni. An attack on Magbeni was not necessary in order to rescue the hostages but an entire company was committed anyway which only served to detract from the primary objective and complicate the operation. Seven men were injured and had to be evacuated by D Sqn as they exited, and another five men were wounded, an unnecessary cost which was isolated from rescuing the hostages. Op Barras was an extremely efficient operation. By the time DSqn was on target at 0640 it took twenty minutes to secure twenty-eight hostages and exit. 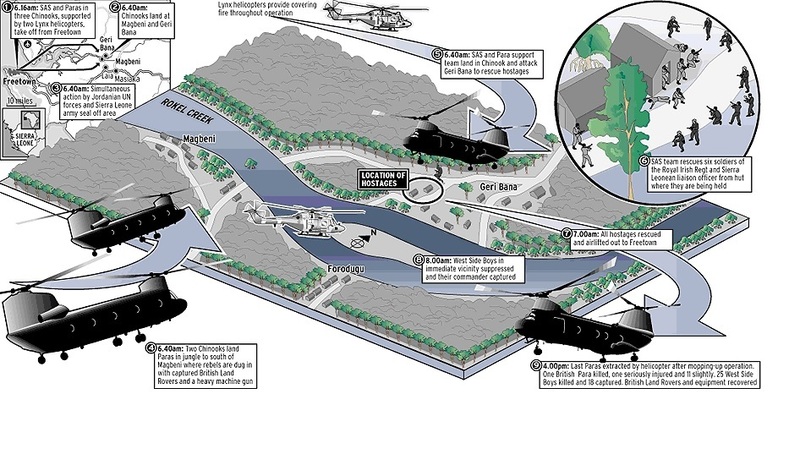 Their helicopter transport contributed to the speed of the rescue as it would have taken considerably longer to reach the hostages by vehicle, so long that it was not a viable option, and would have increased their vulnerability; although aquatic infiltration may have been even quicker as mentioned above. Once on target the men of DSqn’s training, and the patrols help, allowed them to move quickly to eliminate the WSB guards and secure the hostages within minutes. Across the river was a different story, A Company was not the main effort and so they had only one Chinook to transport their entire company. The fact that they had to wait for half their platoon to arrive, at least thirty minutes extra, and their trek through the swamp slowed the men of A Company considerably. From infiltration at 0640 it took A Company an hour and twenty minutes to secure the village of Magbeni, a considerable amount of time when compared to how long it took DSqn to take Gberi Bana, a village and garrison of similar size. A Company would have been optimal as a QRF in case the rescue at Gberi Bana encountered difficulties; the likelihood of the WSB at Magbeni reacting in time to effect the rescue across the river was negligible. Due to the intelligence leak by Land Command the WSB had a notion that British forces were possibly readying to attack them but did not have any specific evidence to warrant a change to their strategy. DSqn, who were not mentioned in the leak, embraced surprise at Gberi Bana, they knew they had to use shock and awe to overwhelm the superior WSB. Their helicopter infiltration and pre-dawn attack allowed them to be on the objective as quickly as possible and to surprise the still sleeping WSB guards. Although, the most vital aspect of surprise were the two patrols that had been monitoring Gberi Bana. At the critical moment when the helicopters were over target and the WSB poised to attack or kill the hostages the eight men of the patrol emerged from the jungle and suppressed the WSB, taking them completely unawares. Across the river, surprise was elusive to the men of A Company as the WSB heard them coming and proceeded to contest their advance from the moment they landed, including through a deep swamp. Operational Security (OPSEC) on Op Barras was good but not without some flaws. The British relied only on intelligence from their trusted sources and did not allow Sierra Leone eyes to view their plans or intel because they knew that there were WSB sympathizers or untrustworthy officials among them. The British also created a cover story to explain the movement of A Company, which worked until HQ Land Command leaked that A Company was in Sierra Leone. This proved a valuable diversion from the SAS involvement but it did alert the locals and WSB that a rescue may be mounted, although the WSB did not act on this information. From the moment A Company arrived in Africa on 3 September they began preparations for the mission. For almost a week the men performed live-fire exercise on a mock-up of the village. Learning the layout of the village, operating in dense vegetation, and preparing for the arduous task of fighting in the African climate all proved invaluable experience, not to mention their previous jungle experience. DSqn’s continual practice once they knew they were going into Gberi Bana, and their already high level of training would give them an advantage. The men of DSqn and A Company knew they were the only chance for their five 1RI brothers and the local hostages. Once they were informed that they were going to be the rescue force, they knew there was no room for failure. The name “Operation Certain Death” identified their feeling; they knew there was a high chance they didn’t survive but there was an even higher chance the hostages died if they didn’t try. The men were imbued with a great sense of purpose which was reflected in their fierce fighting and success. The hostages lives were at stake and so was Britain’s reputation, they could not let these thugs threaten Britain or its citizens. Operation Barras is an excellent showcase of Admiral McRaven’s theory of special operations, both in how the British achieved relative superiority and their, perhaps unwitting, embrace of the six principles of special operations. Op Barras achieved its objectives spectacularly, exhibiting Britain’s elite capability and aiding security in war-torn Sierra Leone. The operation was not without its faults, however, and twelve men were wounded in what amounted to unnecessary retaliation. The Sierra Leone hostages rescued by DSqn were an unnecessary expenditure of time that detracted from the primary goal of rescuing the 1RI men but the British believed that rescuing the civilians would increase local confidence in both the British military and the Sierra Leonean government. Despite its setbacks, Operation Barras is still heralded as one of Britain’s greatest special operations victories and a textbook example of a Special Forces direct action mission. The Revolutionary United Front (RUF) was founded by SLA defector Foday Sankoh in neighbouring Liberia during the late 80’s. Based in the eastern countryside, the RUF began a rebellion against the corrupt government and military regimes in 1991. The RUF has a certain times controlled the majority of the Sierra Leone countryside; including its mines and oil deposits. The RUF is infamous for its use of child soldiers and atrocious crimes (one campaign involved severing the hands and feet of civilians in Freetown). Roberson, Major Walter G, British Military Intervention into Sierra Leone: A case study (Ft. Leavenworth, KS: U.S. Army Command and General Staff College, 2007) ,7. The West Side Boys were avid users of locally grown marijuana, locally brewed “bush” liquor (extremely strong), and cocaine supplied through contacts with cartels in South America. Fowler, William, Operation Barras (London: Cassell, 2004), 10. 1PB, part of the Special Forces Support Group, is a SF support unit formed around a core of airborne infantry and complimented by Combat Support Service members and Royal Marines. 1PB is designed to provide support to SAS, and other SF, operations. HQ Land Command in Sierra Leone was designated the supporting HQ for Barras. HQ sent unnecessary signals to other British units in country about the upcoming operation, unit size, and involvement in negotiations. It is unknown whether it was purely an accident or the information was being fed into the local rumour mill. A Company was only given one Chinook because only three Chinooks were available for Op Barras and Gberi Bana was the main effort. Two Chinooks would be needed by DSqn to ensure all hostages were quickly and safely evacuated. The day of the 1RI men’s detainment the SAS were alerted and inserted two four-man patrols by foot into the forest surrounding Gberi Bana. For two weeks the men remained hidden while gathering intelligence and monitoring the situation. Initially the patrols were not intended to engage the WSB but would be included later in Op Barras planning. McRaven, William H, Spec Ops: Case Studies in Special Operations Warfare Theory and Practice (New York: Ballantine Books, 1996), 4. Despite the obvious risk that the WSB knew a rescue was imminent the DSF went ahead with Op Barras because it was clear to the British that the WSB were going to execute the men of 1RI soon. The British were unwilling to accept these casualties and their plan would minimize the risk involved, even if the WSB had an idea of the rescue.